Hi everyone! I’m Rachel. I run the Instagram account @thecarboholic and I’m here today to share my favorite D.C. carbs with you! For those of you who know me, hello again! For those of you who do not, here are five quick facts that will tell you everything you need to know! 1. I am food OBSESSED (duh). I love to bake, I love to cook, and I love to eat. While carbs and sweets are my “thing”, I can honestly say that I enjoy every cuisine and category of food if it is made well. 2. I lived in D.C. for five years while I attended The George Washington University (GWU) to get my undergraduate and graduate degree in Elementary Education. Three months ago I moved to New York City and I am teaching first grade reading and math! 3. I created my food Instagram in March 2016 but did not think of the name @thecarboholic until February 2017! My account was created under the name @bitesofsydney (I was studying abroad in Sydney, Australia at the time) and was changed to @bitesofdc when I came back home. I was not sure if I would stay in D.C. after graduation and did not want my username to be wedded to one given location, so I changed it to @thecarboholic. It couldn’t be more fitting! 4. I was born and raised in the suburbs of Philadelphia, PA.
5. My three favorite foods are homemade pasta, pizza and cake! And that being said… let’s get to it!! If we’re talking homemade pasta, I find Lupo Verde’s to be superior to any other Italian restaurant I’ve been to in America. That may sound dramatic, but I am a tough critic and wholeheartedly believe it to be true. 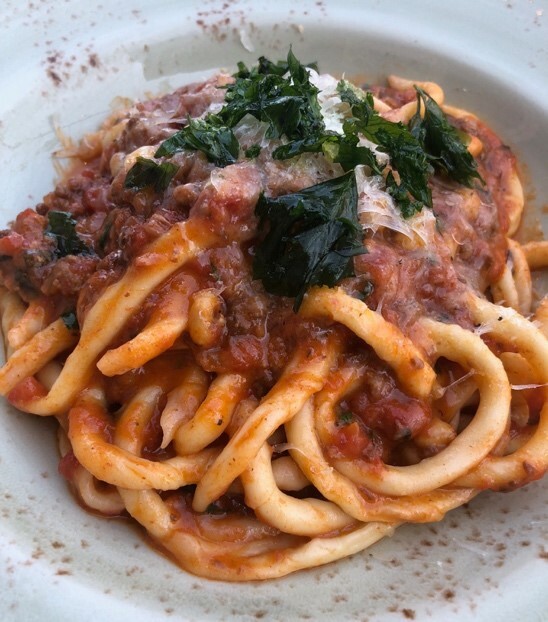 My go to is the Tonnarelli Cacio e Pepe or the Fusili Campani Ragu. In general, I do not find food truck hot dogs very appealing, but Swizzler is the exception to the rule! The “Leonardo Dog Vinci” tops a grass-fed hotdog with fresh mozzarella, housemade pesto, tomatoes and balsamic glaze. It is also served in a warm pretzel bun. Need I say more? Baked and Wired is a Georgetown staple and is the only cupcakery in town that isn’t a chain! There isn’t one baked good from Baked and Wired that I don’t enjoy, but I do of course have some favorites! My go-tos are the Apple Crumb Bar, Uniporn and Rainhos cupcake (essentially funfetti) and the OMG smore’s bar. All of their flavors are great, but the green monster pizza is to die for. I’ve never had a better green pizza. But, if you don’t want to devote your entire pizza to greens, you’re in luck because they will let you combine flavors for a half-and-half pizza! Don’t waste your time going anywhere else to satisfy your burger cravings. Everything you ever needed from a burger can be found right here. Duke’s double-patty Proper Burger is LOADED up with toppings (melted gouda, pickles, onion, sweet chili sauce, rocket and garlic aioli) that will evoke a sensual experience in your mouth. If you enjoy over-the-top, delicious, Instagram friendly breakfast dishes, head on over to Buffalo & Bergen (there’s one in Union Market) for a Lox’d and Loaded! Think doughnut topped milkshake but with less sugar and more alcohol. 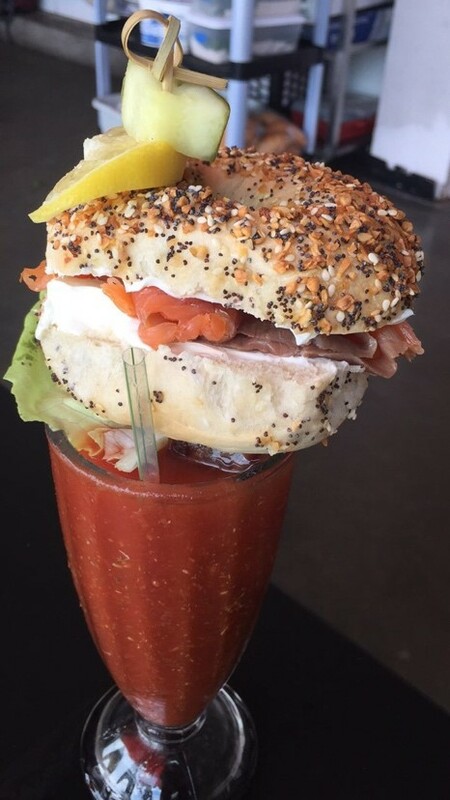 Here you will get a Spicy Bloody Mary topped with an everything bagel breakfast sandwich. This French cafe on 14th street is always buzzing, and I understand why. The atmosphere is nice, the food is good and if you enjoy people-watching you won’t be disappointed. I never (EVER) leave without an order of the Macaroni au Gratin. To date it is one of the best mac and cheese dishes I have tasted. This spot is in Arlington but is worth taking a short drive over the bridge for! Both their baked goods and their sandwiches are delightful. If there are any left, the cinnamon buns and homemade pop tarts are a MUST try! The Nutella is my favorite flavor, but they are all great. I really could go on and on! While NYC certainly has its fair share of good restaurants, I truly do find myself missing some of these D.C. gems. The D.C. food scene has boomed in the past five years and only seems to continue to grow. I hope you find some wonderful carbs within these recommendations and that you will share any newcomers with me that you think I must try! Happy eating!